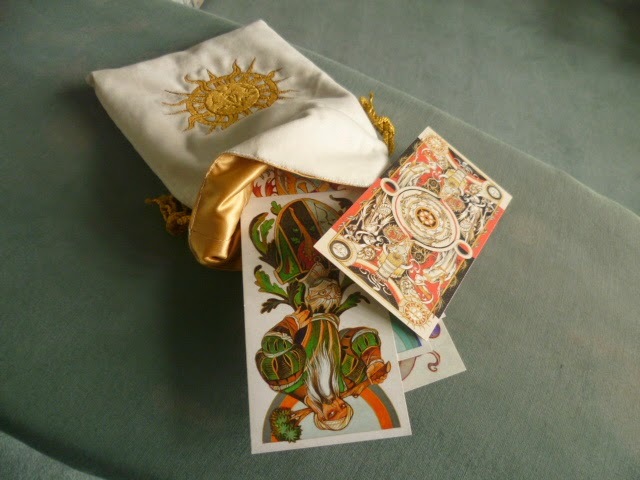 So this technically isn’t a court card blog post, but I HAD to share the beautiful gift that arrived for me in the post this morning: a magnificent custom-made Tarot bag from AniaM. You may have twigged, dear reader, that one of my very most favourite decks is Alexander Daniloff’s Tarot. It has been in a bag, of course, to keep it safe, but I REALLY wanted a custom-made bag to store it in the regal glory that it deserves! And here it is – ivory velvet, lined with gold….. I had sent Ania a few jpgs of tiny sun and moon images that decorate the cardback. 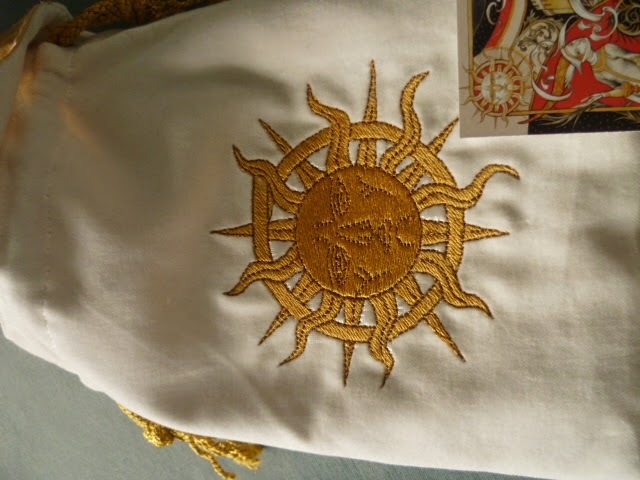 And Ania, clever sausage that she is, turned the sun into a pattern for her embroidery machine. My photo is a bit rubbishy, but you can just see the sun image on the card’s back. And to try to keep it at least nominally court card orientated, that’s the Knight of Wands you can see in that first image. The bag is a pressie from my lovely friend, Viv Kacal. Thank you Viv – I luff it 11/10!!! Show me your favourite Tarot bags and boxes! This bag looks absolutely gorgeous! It is the perfect match for your favorite deck! Lovely! I MUST make a bigger effort to do better with knitting things! I have a half sock that has been on my needles for about 4 years lol!